RescueTime's productivity tools help individuals understand their time so they can make the best choices about how they spend it. They get detailed reports about their time on the computer and have access to powerful tools for setting goals, beating distractions, and staying aware of their time. The individual reports in RescueTime cover all applications and websites (unless ignored explicitly by the user). It's a much more granular view than what is available in the group reporting, and it is private to the individual. Members can see how much time they spent in different applications and websites and see how their time is changing over the course of weeks or months. Each week, all members will receive a weekly email summary outlining how their time was spent the previous week. It helps people stay thoughtful about their time without having to check their reports regularly. Individuals can set up real-time alerts for the time they spend in specific activities. 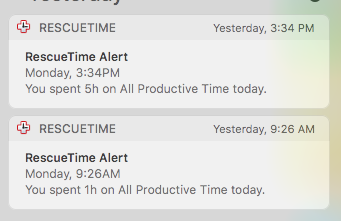 A popular alert is "5 hours of all productive time". Alerts can be set for different productivity levels, categories, applications or websites. It's an excellent way for users to establish a personal feedback loop to stay productive. Individuals can block out distractions during times they need to focus with FocusTime, our distraction management tool. Users will specify a period of time they wish to focus for, and all distracting websites will be blocked. Additionally, API integrations can be configured by the user to block incoming distractions, such as muting their phone or signing out of Slack. In addition to the automatic logging by the RescueTime app, team members can also manually log personal daily highlights. These are short snippets of text describing the work they've accomplished throughout the day. Members can set up automatic prompts to enter highlights at intervals throughout the day. 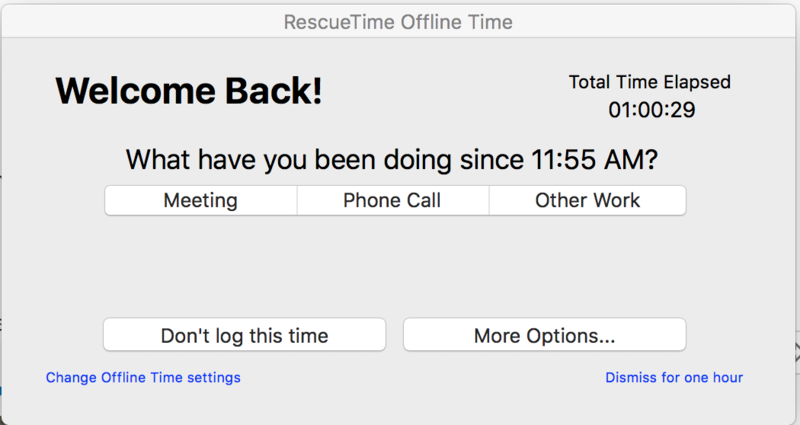 The RescueTime application is excellent for logging time on the computer, but there is also a lot of time in the day that takes place away from digital devices, such as meetings, lunch, and errands. 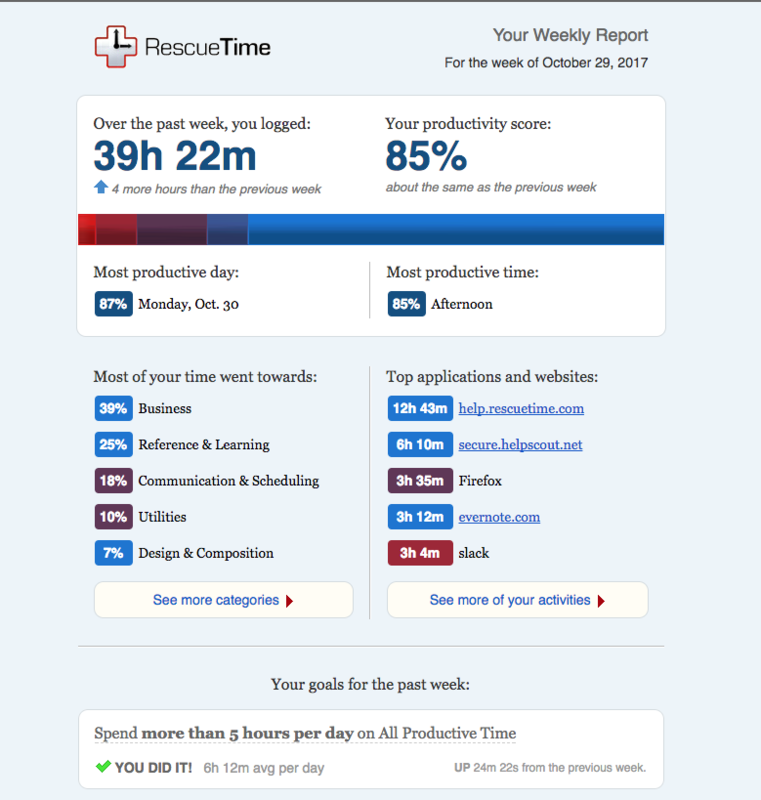 RescueTime can be configured to prompt members for an update when they return to their computer after a prolonged time. We refer to this feature as Offline Time. What is RescueTime for Organizations?